5/3/13 - Acquisition - New York, Metropolitan Museum - Paul Jeromack announced it in an article published in The Art Newspaper : the Metropolitan Museum last 29 January purchased a drawing by Jacques-Louis David at an auction held at Swann Galleries in New York for the very reasonable amount of $700 ($840 with charges) ! 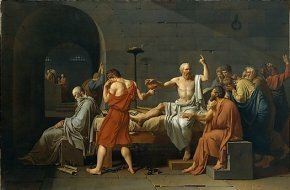 First presented as a copy of the painting in the Met, The Death of Socrates by an anonymous French artist of the early 19th century, the drawing nevertheless attracted the curators’ attention, recognizing it as an actual David. Once the attribution was made, it became self-evident, with the work presenting all of the characteristics of the artist’s drawing hand. Furthermore, it presents several variations and is slightly squared for transfer. This story has probably set many art dealers and French museums dreaming. If this had happened in Paris, it would have been very difficult, even impossible to benefit from such a discovery, unless - for the art dealers - it had been rushed outside the country. This is the result of an inane legal precedent which forbids anyone having discovered a work sold at public auction to benefit (we should recall notably the affair concerning the Pardo Poussin and the case of the Saint-Arroman Poussin acquired by the Louvre for a very low price and which it had to return !). A David drawing as important as this one could have reached, if correctly attributed, a price of around 400,000 or 500,000 euros. It appears that in the United States if anyone is accountable, it will not be the Metropolitan Museum  in any case which will be able to enjoy its beautiful discovery, and we feel rightly so. This affords us the chance to publish a drawing recently acquired by the Metropolitan Museum, an establishment which makes so many purchases that it is practically impossible to provide an account of every single one. However, we will soon publish a few articles highlighting the most important sheets which have recently joined the collections and will include all the others in our upcoming database. According to Paul Jeromack, the museum acquired it, as always, via its agent Katrine Bellinger.